Lantern Moon's exquisitely handcrafted crochet hooks. **** Lantern Moon Crochet Hooks are currently SOLD OUT. We have more on order, and we'll update everyone as soon as they arrive.Please email us to get put on our email notification list for Lantern Moon! Gorgeous Ebony and Rosewood Crochet hooks - shown at left, the ebony are a warm reddish grained color, while the ebony crochet hooks are dark and tend towards a more dark mahogany solid tone. All of them are very individual, and the color and patina will vary considerably. Let us know in the comments area what type of coloring you prefer - dark, light, solid, and we'll try and match it! Need a beautiful hook NOW? Our ZEN Crochet Hooks in Rosewood and Ebony are just the ticket! 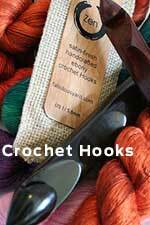 Perfectly hand made for us - these smooth as silk Crochet Hooks are lovely to work with!